The Grand Traverse line is reminiscent of the old rattan made by Marshal B. Lloyd, yet is produced in a custom vinyl woven strand. The Lloyd®/Flanders custom vinyl is extruded to emulate our original loom fiber. Grand Traverse is the pinnacle of traditional styling with its hand-woven open lattice. Occasional items such as the tea cart and plant stand compliment this group with serviceable pieces to cater to any celebrated gathering. 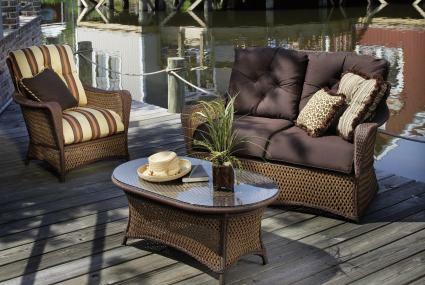 Available in Caramel custom vinyl and 230 all weather acrylic fabrics.